• Standard Data Battery 7.2V (730mAh) Lithium-Ion, up to 1.5 hour recording. 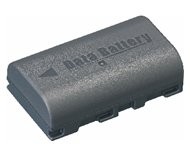 • This data battery enables view of remaining battery and recording time at the touch of a button on the JVC Camcorder, even with the power turned off. • "NOTE" The battery life shown is an approximate time and the actual time may vary depending on the model. Please refer to your instruction book for actual run & charging times. Feature usage will affect power consumption and battery life.